Morning cruise - mon - fri | 10. 30-12. 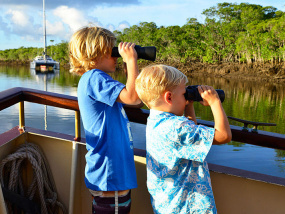 0	adult $35, children $15, family $100 the iconic lady douglas takes you searching for estuarine crocodiles and other wildlife, on an idyllic calm water river cruise through the mangrove forests around port douglas. 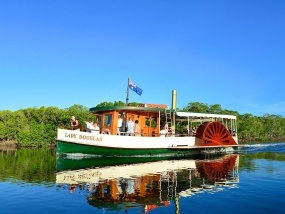 All cruises showcase a wide variety of visual delights; take in the spectacular wilderness and scenery of the mangroves, wildlife, shipwrecks, and harbour and coastal views around the inlet entrance. 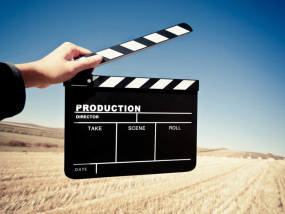 The commentary delivered by the captain is informative and entertaining, with comfortable and relaxed surroundings, and no chance of getting seasick, despite the weather. We are a calm water cruise and have covered seating over the entire back deck. 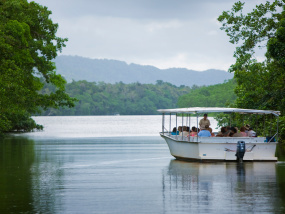 Substantial time on board is spent searching for wild estuarine crocodiles in their natural habitat and exploring the mangroves. 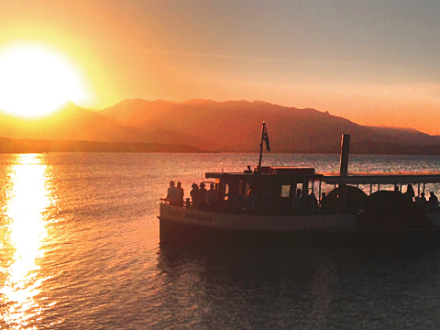 Sunset cruises include a stunning sunset at the end of the tour. 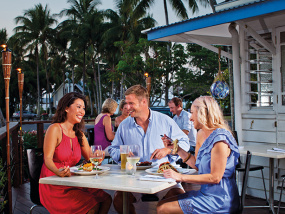 Join Tourism Town Port Douglas! Mother's Day is coming up. 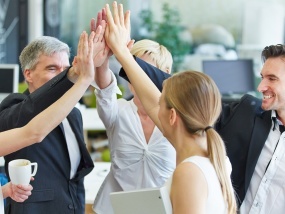 Now’s the time to reach out to your customers! 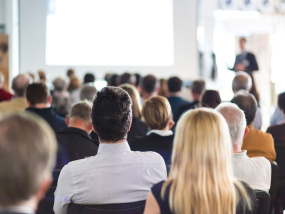 Join our "TOP 2019 TNQ MOTHER'S DAY DEALS & EVENTS CAMPAIGN" to maximise direct sales for you this Mother's Day! 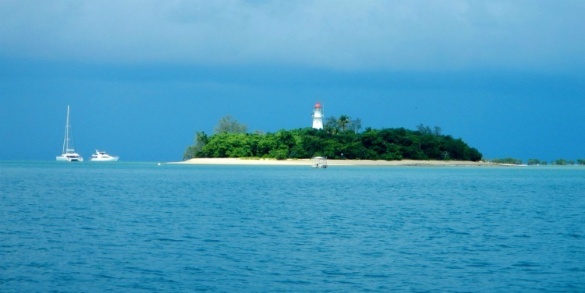 Originally established in 1877 as a link to the Hodgkinson gold fields, the port (named "Island Point" and then "Port Owen") quickly grew to accommodate the increasing trade brought by the gold rush. The dray teams and stage coaches that serviced the goldfields made their way from the Port, down the beach (now Four Mile Beach) to the "Four Mile" mark which is now called Craiglee. From there they continued over "The Bump" and then onto the goldfields. 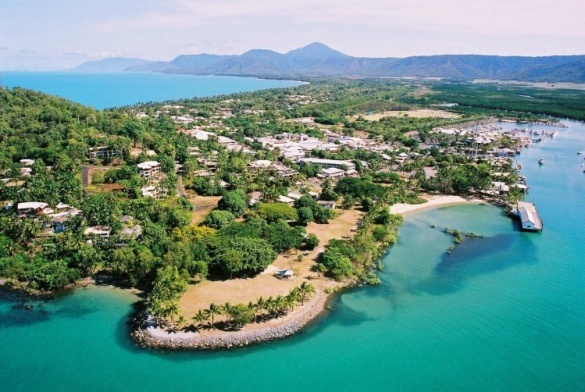 By 1882 the port had been renamed "Port Douglas" and declared a Port of Entry for Dutiable Goods.A courthouse, police barracks ( for 30 troopers ), warehouses and hotels were built and the population rose to over 8000. However the decision to build a railway -providing all weather access - from the goldfields to Cairns saw the trade (and fortunes) go south. The sugar industry had become firmly established by 1897 and the opening of the Mossman mill saw the focus of any development move from Port Douglas to the town of Mossman. 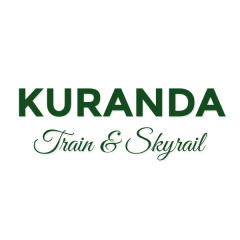 On August 1st, 1900 the tramline from south Mossman to Port Douglas was opened. 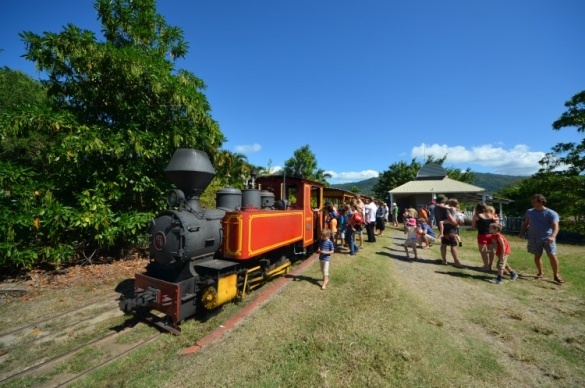 The 2ft, narrow gauge tramway was to transport passengers, goods & bagged sugar between Mossman and the wharf at Port Douglas. The original loco -"Faugh a Ballagh" meaning "Clear the Way" in Gaelic carried more than 23,000 passengers over 5,800 miles in it's first year. The "Faugh a Ballagh" continued to serve the Port until April 1958 when the Mossman mill received permission to transport sugar by road. After the last bag of sugar was unloaded at the wharf that day, the "Faugh a Ballagh" was returned to the Mossman depot and retired. Today the restored Locomotive is on display by the Marina Mirage. 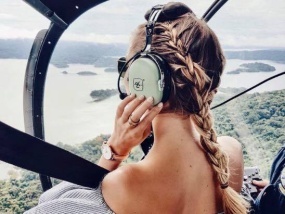 Picturesque Port Douglas has become an international holiday mecca with classy five star to budget accommodation, shops, galleries, and enticing restaurants. 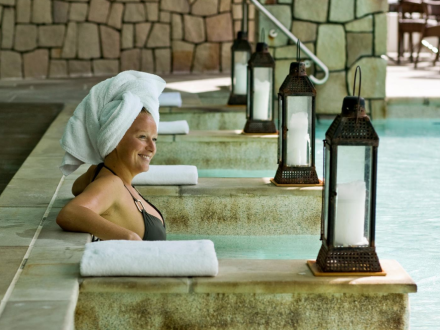 In this sophisticated yet laid back tropical paradise you can play golf, shop in world class specialty shops and dine in exquisite tropical ambience. 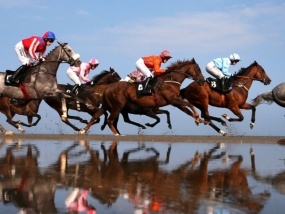 Or simply relax on beautiful Four Mile Beach. 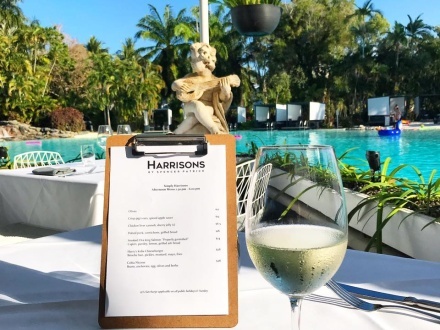 With a permanent population of about 3500, this laid-back town comes to life in the winter months as visitors from around Australia and the world come to enjoy the mild winter weather and all Port Douglas has to offer. 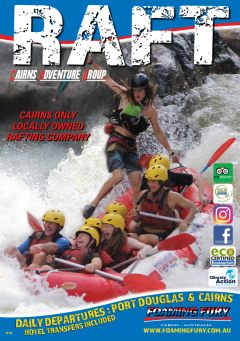 With the Great Barrier Reef on the doorstep, and the Daintree Rainforest in the backyard, you will be inspired by the amazing array of nature and wildlife. 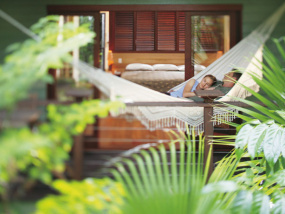 The tropics are a feast for the senses; the sights, sounds and tastes; you will never want to leave! Cruise, dive and fishing boats depart daily for reefs, islands and cays, while day tours and safaris cover the coastal and inland regions. There's a unique rainforest habitat where you can experience life in a tropical forest at birdseye level, observing native wildlife from treetop walkways. 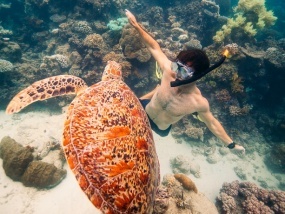 Australian wildlife is as diverse as the landscape and Tropical North Queensland is home to many of Australia's unique species. 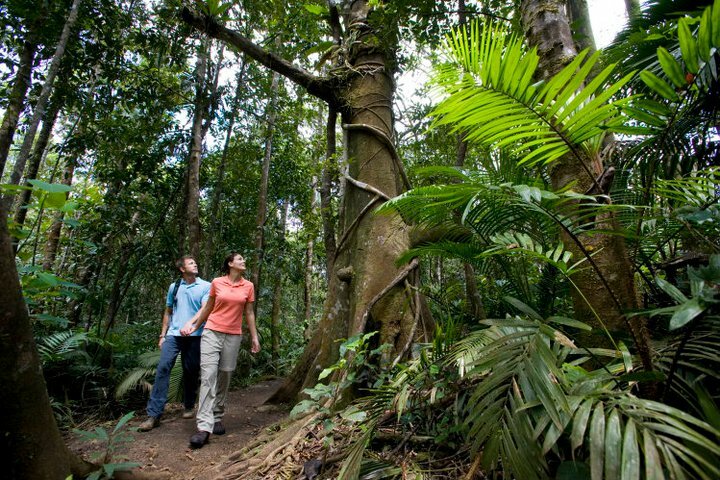 Nature lovers are spoilt for choice in the Wet Tropics, with rainforest walking tracks, refreshing waterfalls and hidden creeks. 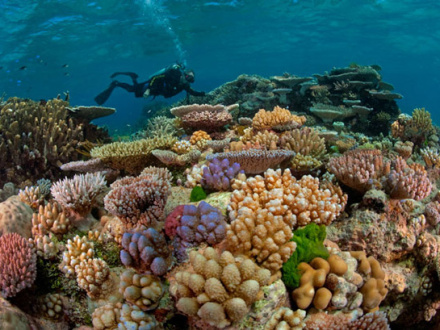 The Great Barrier Reef is just 13 kilometres (8 miles) off-shore, affording excellent access. 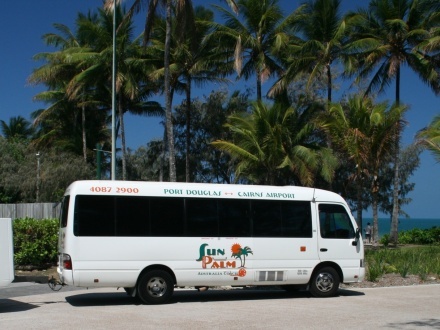 The north's first Outer Barrier Reef cruises from Port Douglas in the early 1980's hastened the rebirth of the sleepy village of Port Douglas. 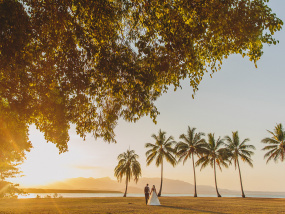 Sharing the same tropical latitude as Tahiti, Port Douglas attracts visitors for its superb climate, enticing resorts, wide tree-shaded streets, international cuisine and accessibility to world class attractions. 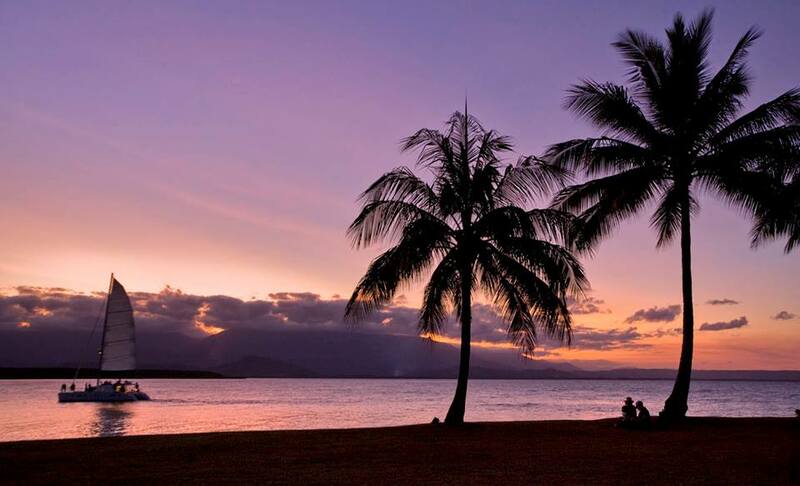 As well as the Great Barrier Reef & Daintree Rainforest, Port Douglas is ideally located for day trips to Cape Tribulation, Mareeba and the Atherton Tablelands. 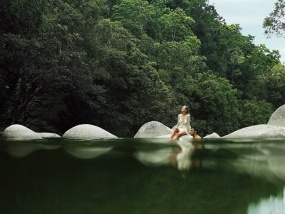 Some of the most enticing resorts in the world are to be found around this seaside village and its lush coastal hinterland. 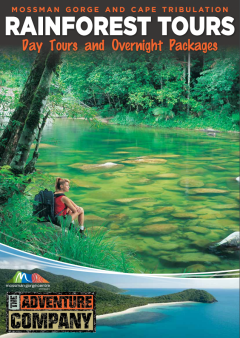 At nearby Mossman Gorge you'll discover rainforest walking tracks and refreshing swimming holes. 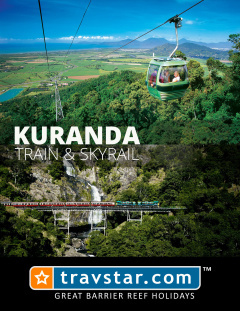 North, between the long sandy beaches and mist-capped mountains, are more well-concealed resorts, lodges and hostels, also sugar, fruit, tea and coffee plantations, a rainforest theatre, walking tracks and mangrove boardwalks. 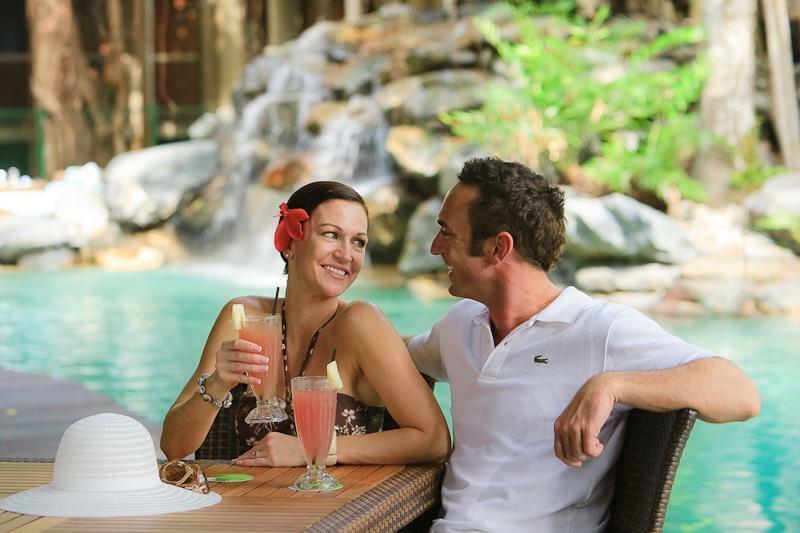 Holiday accommodation in Port Douglas is available to meet all expectations and budgets: Including luxury resorts, rainforest retreats, self-contained family apartments, campgrounds, backpacker hostels and budget accommodation. 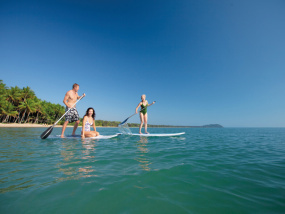 Offering the ultimate selection of Tropical North Queensland day trips, Port Douglas is an ideal base for Scuba diving, snorkelling or fishing on the Great Barrier Reef, exploring the Daintree Rainforest and River, or sailing away over the Coral Sea. 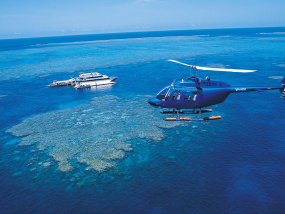 Port Douglas time is G.M.T + 10 hrs. (There is no daylight savings in Queensland). 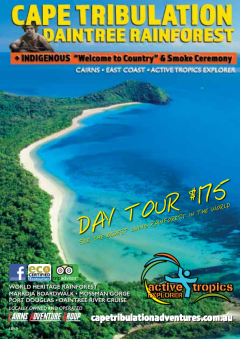 Situated approximately 1 hour drive north of the Cairns International Airport, in Tropical North Queensland.